Update (4/18/16): Recent lab results have confirmed theories that last May's mass die-off of 211,000 saigas (initially estimated at 60,000) was caused by a bacteria-related infection. While scientists have pinpointed Pasteurella multocida as the culprit, they have yet to determine what triggered this normally harmless bacteria to become so deadly. Another mass die-off took its toll on an already endangered species as 60,000 animals mysteriously died earlier this summer. And we still don't know why, according to a recent article in Live Science. 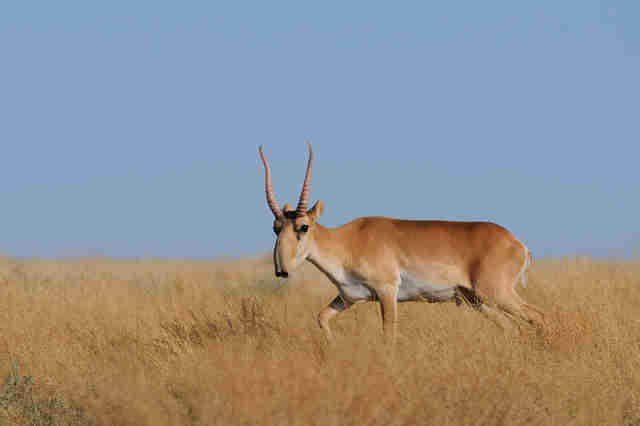 Saigas, a type of antelope known for their prominently shaped noses, have been dying at alarming rates this year. Though other species occasionally experience massive die-offs, this one is particularly worrisome, because there are only a few saiga herds left in the world: several in Kazakhstan, one in Russia and one in Mongolia. Live Science recently interviewed geoecologist Steffen Zuther, who was in Kazakhstan studying a herd of 60,000 saigas, when the incident occurred. In just four days, the entire herd was gone. Bacteria played a role in the recent saiga deaths, according to Live Science, but the exact cause is still unknown. Massive die-offs have struck saigas before, such as one that took the lives of 12,000 last year, but this one was unprecedented. "The extent of this die-off, and the speed it had, by spreading throughout the whole calving herd and killing all the animals, this has not been observed for any other species," Zuther told Live Science. For now, there are still thousands of healthy saigas in the world, but they are still an endangered species - thankfully, scientists will continue to investigate the specific cause of saiga deaths. Hopefully, they'll find the answer soon. Read the full Live Science article here.